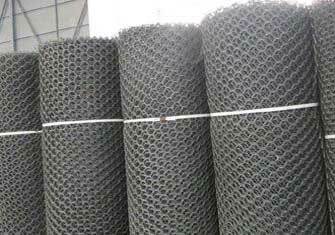 Geonets are composite grid constructions used for drainage capabilities. Usually a Geotextile is used as the drainage core with an upper and lower section of geomembrane. Geo-Nets are commonly used between two geomembrane liners as part of a leak detection system. They are also used above and below Geomembranes to move liquids or to provide a path for gases. Geo-Net is a high flow Triplanar Geonet. It utilizes a tri-planar structure with rigid vertical ribs. These ribs significantly increase the tensile strength and compressive resistance of the Geonet.